Well now, consider yourself napturally inclined! Naptural (Nappy+Natural) Hair is a controversial term in itself, full of good (and bad) identifiers for the African American community. Within my research, I have found the Black community’s mentality behind why and why they do not choose to wear their hair in it’s naptural texture, signifies a great number of things. From negative perceptions and low self confidence to historical freedom and fashion statements. View my Naptural Hair Journey (pictured below) in full: here. Project Naptural is a socio-cultural initiative designed to initiate and sustain positive change in how and why many black women form and frame perceptions about their identities by choosing to wear their hair napturally. In short, this project will help to educate women about the options they have with their natural hair, how to care for it, who to see if they need help and empower themselves with the connection in the African American community. 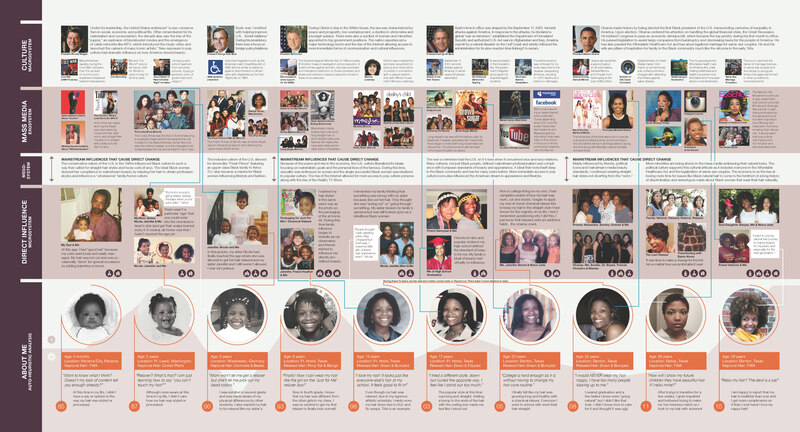 What type(s) of interactive tool or system of tools or educational display system(s), or some combination of these, that offer(s) information about African American hairstyles, hair care, hair experiences and overall physical health might most effectively enlighten African American women about how and why the style choices and affordances available to them regarding the manipulation of their naptural hair affects how they perceive themselves and how they are perceived by others? In short, the final product of Project Naptural will be a traveling gallery exhibit that will allow women of all cultures to come together to learn more about the beauty of natural hair. In conjunction with this, I will create a mobile application that will further my efforts of enlightenment, empowerment and connectivity amongst the women in the Black community.